Home > Health > Alcohol and Your Job: Are You At Risk? Alcohol and Your Job: Are You At Risk? Alcohol and your job go together if you are a pilot, doctor, aid worker or bar tender. You’re considered high risk, and employers look at what you do on and off-shift. Why are these professions more prone to heavy drinking? The irregular schedules, stress and conditions of work impact relationships and health. Some turn to abusive behaviours as a result. While a drink can be a relaxing come-down after a hard day, the effect of even a small amount of alcohol can have dire consequences. This is Part 3, in The GOODista’s series about alcohol. Part 1: Alcohol and Healthy Living: Drink or Leave it? gave you the effect of alcohol on the body, and Part 2: Alcohol: The Healthier Drinking Guide a checklist, tips and tools to combine an active lifestyle with the occasional drink. In this last instalment, we explore how some jobs are more vulnerable than others when it comes to alcohol. Some professions have rules that guide how much you can drink, whilst other jobs that are equally as demanding have guidelines and suggestions. What about your job? Can one drink make a difference? While drinking is a personal choice, some employers are more strict about employees leisure drinking. Why is that? Alcohol and your job: Is it an issue? Is alcohol an issue in your job? To set limitations, or not, has been an ongoing discussion in many professional categories. Recorded incidents, accidents and near-misses (aviation, military for example) have led to stricter application of how much an employee can consume on and off the job. Alcohol related illness and absenteeism has provided a stronger focus on workforce wellness. Initiatives to relieve stress and working conditions are considered (for instance in aid organisations). Jobs with high levels of stress are more likely to be vulnerable to abuse of alcohol. Whether you are a pilot, a doctor, a bartender or an aid worker – stress is part of your job, as is shifting schedules and impact on home and health. While a drink can be relaxing, the effect of even a small amount of alcohol is such that we as passengers, patients, customers or affected populations cannot ignore it. Ask yourself why there are rules for pilots, guidelines for doctors, and no limits at all for bar staff or aid workers? Keep on reading to what applies to alcohol and your job. It’s difficult to pinpoint exactly why some jobs seem more prone to heavy drinking. There are some obvious factors that contribute to the problem, such as shifting schedules and stress. The International Labor Organisation estimates up to 25 percent of the international work force drink heavily enough to be at risk of dependence, and up to 5 percent are alcohol dependent. Pilots, Doctors and Lawyers: Among the professions traditionally thought to be more susceptible than average to alcohol misuse are those of doctor, commercial airline pilot, and lawyer. Some studies have correlated occupational stress as a risk factor for alcohol dependence. Yet evidence to support such claims remains inconclusive. Bar Staff: According to the Office for National Statistics, in the UK, bar staff are among the professionals with the highest risk of dying from alcohol consumption. Aid Workers: A hidden group that has come to the forefront when it comes to alcohol abuse vulnerability is humanitarian aid workers. The job takes you around some of the most hostile regions of the world, and can be greatly rewarding. But, the reality of what you see, duty station challenges and frustrations with UN / NGO bureaucracy adds up. It is apparent that the constant pressures lead many into self-abusive behaviours. Alcohol and Your Jobs: Rules, Guidelines or No Limits? Why are there rules for pilots, guidelines for doctors and no limits at all for aid workers or bar tenders? These jobs take care of other people – although in varying functions – and are all high-stress. Drinking alcohol tends to be common place. If you belong to a professional group where stress is a real factor, you have more reasons than not to consider a healthy lifestyle and healthier drinking habits. What do you think? Is it right to regulate employees leisure drinking, or should we instead look at other options, such as stress counselling? Let’s look at the rules, guidelines or no limitations set by employers in so-called high risk groups. Planes, trains and automobiles have laws that regulate how much blood alcohol concentration (BAC) you can have in your system, as even small amounts of alcohol in the system affect judgment and coordination. The military take the same stance. Aviation: If you operate aircraft the aviation rules say ‘8 hours from bottle to throttle’, and may not operate an aircraft with blood alcohol percentage of 0,04% or greater. 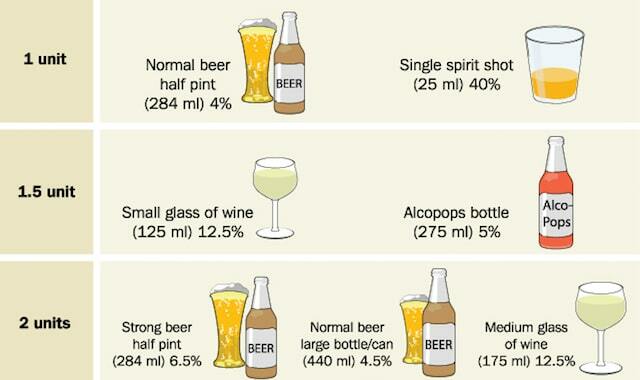 In reality terms: A man, who weighs 80 Kg, stops drinking for 8 hours after having consumed 6 small pints – will still have 0.04 % blood alcohol in his system. Try the test: Blood Alcohol Level Calculator. Professional Drivers and Operatives: Under the Railways Transportation Safety Bill the UK have introduced new lower limits for those working in the transport industry. The limit is just 0.02% – one-quarter the UK Drink-Drive limit of 0.08% and the lowest detectable level possible allowing for the residual levels that can exist in anyone whether they’ve been drinking or not. The new lower limits also apply to pilots, cabin crew, air traffic controllers, aircraft engineers, train drivers, and commercial seamen. Did you know that? Military: The US changed lowered the Marine Corps’ limit for on-duty drinking standards in 2012, and a result of only 0.01 percent would lead a soldier to counselling. The Navy, Air Force, and Army do not allow an alcohol reading of 0.05. Failure to stay within the legal limits can lead to a dishonorable discharge. We can understand and appreciate the stance with legal limits set, just like we ourselves are very aware that we cannot drink and drive under the influence of alcohol. Aid Workers and Bar Staff: No Limits? If you are exposed to a humanitarian disaster, or a customer in a restaurant or bar you will have very different ways of being vulnerable when it comes to those that help, or serve you. An aid worker can mean the difference between life and death if the wrong judgement call is made, whereas a bar tender is not likely to threaten your wellbeing by being under the influence of alcohol. The stance taken by the professions also differ slightly, but boil down to little or no control of the alcohol consumption. Humanitarian Aid Workers: Prior to entering an aid organisation is it recommended that the agency medical staff do a health and medical check-up. “Identifying alcohol or substance dependence, depression, or other psychiatric illness is important, as these conditions may be exacerbated by the stress of the mission and are often the reason for emergency repatriation.” (Traveler’s Health, CDC). To note it that once you’re in the job – check-ups and workforce wellness initiatives are far and few in between, although some organisations are becoming more aware with regard to preventative care (stress counselling etc.).. Bar and Waiting Staff: It is up to a bar or restaurant owner to set the rules for their establishment, and while it is understood that drinking while working is not a great idea – the after shift free drink is common place. Many countries impose laws on how a bar staff must act when confronted with intoxicated customers, and how much (or not) they can serve. However, there are no laws per se set with regards to the staff themselves although the statistics show this profession as especially vulnerable. Alcohol and Your Job: To Drink or Not? A drink after a days work is a welcome come-down, but when your job depends on your ability to exercise judgement in a given situation the thought: “Hold that drink!” may enter your mind. Alcohol consumption is not equal to being dependant, nor does it mean that you are automatically unhealthy. What is clear is that alcohol is a relaxant, and as such has an effect on body, mind and spirit. The problem lies not in the consumption of your favourite tipple, but in the effect alcohol has on you. Each individual can get affected differently – and at different times in their lives. If you are about to drive a car, you wouldn’t drink. You know that it can cause harm to others, as well as yourself. However, if you work in an environment where drinking is part of the culture, and considered almost a social must – the ability to say ‘No!’ or to think that your drinking could be unsafe to others may not enter your mind. Nor do you necessarily think about the link between your own health, fitness and ability to stay in balance. It isn’t that one drink that is the issue, but the longterm, regular intake that can present a question mark. Some professions are especially vulnerable in situations of high-pressure, combined with what they experience on a daily basis. That end-of-day drink is seldom a happy one. The effect of alcohol when consumed in times of pressures, high-volume work and when generally fatigued allows for a road where abuse can become a factor – with all its unwelcome longterm impact. Most of us are able to judge whether to drink or not. It is a personal choice based on beliefs, health concerns, fitness aspirations and overall professional responsibilities. What do you think? Are you at risk? If you like articles about health, fitness, mindfulness and lifestyle changes you can do every day and working (far) away) – Subscribe to The GOODista to Feel, Be and Do Good. A very well researched series, thank you! It makes many of us to reflect on our life styles, and daily habits. Thanks also for great illustrations! In hot outdoor temperatures, we all feel better with water than with alcohol, that’s for sure.